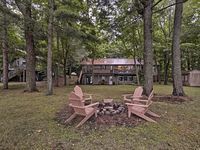 Property 12: Cabin on Blake "Too"- Gorgeous, lakefront, private, modern cabin! Property 13: Executive retreat nestled in the trees of pristine North Pipe Lake. Property 15: It's the perfect lake cabin. 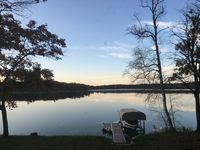 Property 19: Amazing Location, Great Fishing Sunfish, Crappies, Pike, Muskie! Property 23: Life is better at The Wapo Lodge on Lake Wapogasset! Property 25: Remodeled Cabin on Bone Lake by Snowmobile Trails! Property 31: Incredibly charming Log Cabin on the water! We and our adult children/grandchildren stayed there 5 nights at the end of August. The house is new, immaculately clean, and has everything you need for your stay. The beds were really comfortable, and we especially enjoyed the porch for morning coffee/enjoying the beautiful scenery and early evening hangouts. There were toys for kids, a pack 'n play, a baby gate, and a selection of movies for the rainy days. The owner was great as far as communicating and answering questions and we really appreciated that. We got our full security deposit back in a timely manner. The place was perfect and I highly recommend it. We also liked the option that we didn't have to book an entire week as we like to take shorter, more frequent trips. The lake is big with many inlets and places to cruise and explore. It is very busy on a weekend, but there was room for everyone and the other boaters (with the exception of some of the jet skiers) were very friendly and courteous of other boaters. On Monday, however, we felt like we had the lake to ourselves! There were 2 restaurants on the lake, Thirsty Otter and Paradise Landing. We ate at both of those and the food was very good. Our only minor downside was parking our boat. Because of the inclemete weather forecast on our arrival we decided not to launch our pontoon until the weather cleared... so were just going to park it at the house and hopefully launch it the next evening. However after turning off the road and into the winding private dead end drive (the house is the second house after you turn off), there was no room to turn the boat around. It was very dicey trying to get it finally turned around, so if bringing your own boat I would be sure to launch it first. This did not diminish our rating of the house, if the weather had been decent, it wouldn't have been an issue.